Corundum or Sapphire is best known for its gem stone varieties, Ruby and Sapphires. Ruby and Sapphires are chemically the same mineral but just different in color. Ruby is the red variety where as a Sapphire is the variety that covers all other colors except Padparadscha which is a soft lotus blossom pink and extremely rare. 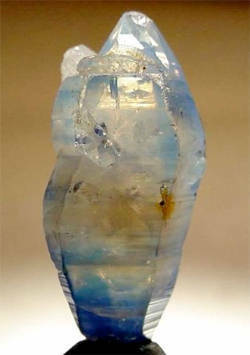 However, the most popular and valued color of Sapphire is blue. Sapphire is generally used to describe the gem variety, otherwise it is simply called Corundum and comes in a rainbow of colors from pastel pink to rich pinks and vivid and bright yellow. Please see our pages on sapphires and unique colors. At Sapphire Ring Co we keep a full range of colors to show how beautiful the sapphire gem stone can be in a variety of colors outside the traditional blue. Corundum is a very hard, tough, and extremely stable . For all practical purposes, it is the hardest mineral after Diamonds, making it the second hardest mineral. It is also unaffected by acids and other chemicals. Translucent brown Corundum and Emery are the most common forms of Corundum with only commercial value and used for their abrasive qualities. Corundum is easily synthesized, and many Corundum abrasives are synthetic. Synthetic gems are also easily created by adding traces of certain color producing elements to the Corundum solution, and letting the solution solidify into a boule, or synthetic, unprocessed "mineral" with a particular shape. This process is called the Verneuil process. Natural Ruby and Sapphire gemstones may have their color artificially enhanced or deepened through chemical enhanced whilst being heated to extreme temperatures. Today these treatments have become much harder to detect. Due to these complex treatments, we have all of our sapphires fully certified by the top Gem laboratories in the world for gem stone identification.